I love October. It's my favorite month...my birthday, Halloween, Vegan MoFo(http://www.veganmofo.com/), fall, pumpkins, my birthday (did I already say that?). See! A lot of things to be happy about!! 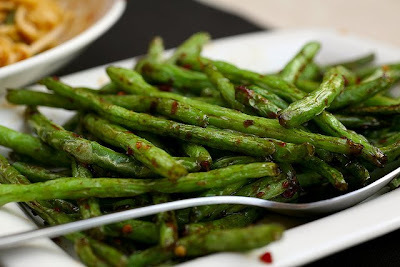 This weeks recipe is Sweet & Spicy Green Beans. Which is my version of P.F. Chang's Spicy Green Beans. Submerge french beans in pot of boiling water for about 5 minutes, and then shock in a cold water bath to stop cooking process. Mix the remaining ingredients in a bowl and whisk to blend. Heat a frying pan over high heat. Add french beans, saute for a minute to reheat and then whisk in sauce. Stir to coat and let cook about 5 more minutes to allow honey to caramelize. Serve with white or brown rice. I usually eat mine as a main dish, but they make an excellent side dish too. Also check out the Vegan MoFo site...lots of great recipes for Meatless Monday's!